Long before there was a Donald Trump, there was a genius of an American demagogue who'd put him in the shade today. And long before there was a Hillary Clinton of Clinton Inc. to express horror at The Donald's rise, there was a Standard Oil, Inc. to shudder at the prospect of a Huey Long as the Kingfish of American politics. Who looks after s----kickers like you? By 1932 Huey Pierce Long of Winnfield, La., was already the classic Man on Horseback -- only he didn't need a horse, just a truck and a loud speaker. As prim John McClellan, a voice of the Arkansas establishment, soon discovered. For this outside agitator had dared cross the (state) border and campaign for a poor widder woman named Hattie Caraway here in Arkansas -- and that year she beat all comers like a drum. Thanks to the indefatigable Huey Long, for this "outsider" knew his audience inside and out, whether friend or foe. Huey Long electrified all who heard him. He didn't just speak to the poor and ill-favored; he incarnated their long-simmering resentments. And they had much to be resentful about. By 1933, almost one out every four Americans was unemployed. And there was Huey Long to articulate all their hopes and fears. And how. For he was a rhetorician par excellence who would have made either Donald Trump or Hillary Clinton look tongue-tied by comparison. 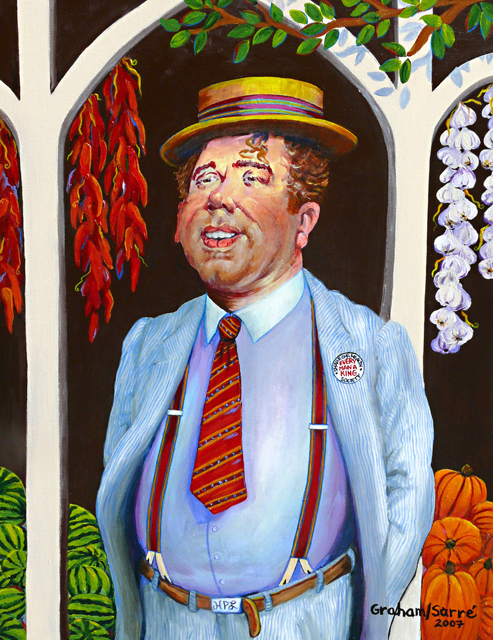 Here is just one performance from Huey Long's inexhaustible repertoire: Speaking to a grimy crowd of sharecroppers and day laborers, as well as the kind of respectables who had come to hoot but would stay to be converted, Huey would ask: "How many of you wear silk stockings?" Nobody raised a hand. "How many of you wear cotton socks?" Hands went up. Huey would then raise a pant leg and show his cotton socks. But he was just getting started. "And how many of you have holes in your socks?" Huey showed he did, too. And the crowd was his. Huey never forgot a friend -- or foe. As a young lawyer, he'd put his savings into oil stock, which looked like a good bet at the time. But Standard Oil enjoyed a monopoly on all the oil refining in the state. All the oil tanks, too, and it wouldn't take oil from independent producers. So Huey lost everything. After that, Huey Long went after Standard with a vengeance. He called it a criminal enterprise -- indeed, one the world's greatest. He pointed out that working people had to pay 40 times more in taxes than Standard Oil did. Much like the Socialist-Independent-Democrat Bernie Sanders going after the 1 percent, or Hillary Clinton pretending to be horrified by the connections and tax breaks enjoyed by a tycooness like herself. There's another difference between Huey Long and the unlettered and unemployed he rose to speak for: He was a genuine scholar. None other than the Chief Justice of the Supreme Court of the United States at the time, William Howard Taft, said he was among the best legal minds ever to argue a case before that court. But he had even higher aims, like the presidency of the United States. In the meantime, he had work to do and unpaved miles to go back in Louisiana, where he proceeded to go to and fro, promising everything from free textbooks to fair taxes. And delivering. "And it is here, under this oak, where Evangeline waited in vain for her lover, Gabriel, who never came. This oak is an immortal spot, made so by Longfellow's poem, but Evangeline is not the only one who has waited here in disappointment. "Where are the schools you have waited for your children to have, that have never come? Where are the roads and the highways that you sent your money to build, that are no nearer now than ever before? Where are the institutions for the sick and disabled? Evangeline wept bitter tears in her disappointment, but it lasted through only one lifetime. Your tears in this country, around this oak, have lasted for generations. Give me the chance to dry the eyes of those who still weep here." Huey's opponents set out to impeach him, but Huey had seen it all before: "I was elected Railroad Commissioner in 1918, and they tried to impeach me in 1920. When they failed to impeach me in 1920, they indicted me in 1921. And when I wiggled through that, I managed to become governor in 1928, and they impeached me in 1929." And were willing to invest a lot of money to do it -- "enough money to burn a wet mule," as Huey would say. But all his enemies' efforts failed. Not until the Nixon presidency and the Clinton co-presidency would so much time and effort be put into going after a head of state. If his opponents were furious with him, Huey would make them furiouser by flaunting his showmanship in their faces. Donald Trump's trademark words ("You're fired!") would be tame indeed compared to Huey's vocabulary of invective. Maybe because Governor, Senator and presidential contender Long backed up his words with the gaudiest of deeds. He wanted a new state Capitol building, so he built the tallest one in the nation. He wanted a winning football team and so gave the team pep talks at halftime. He wanted a marching band and so led a 250-piece one through the streets of New Orleans. He wanted the state to have a modern medical school and so added one to LSU's offerings. Just like he promised he'd do? The Kingfish gonna save this land.